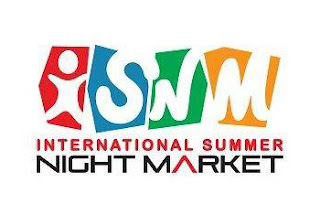 Believe it or not, I've never visited the original International Summer Night Market in Richmond. No, and it has nothing to do with being located in Richmond either... I've been to the other one countless times, but have only a half-hearted attempt to show for the ISNM. But with an invite and free parking in hand, I gave it another go. Also invited was Sean, which was a huge relief as there was no way I could finish all that food by myself (really!). Before I even got my bearings after parking the car, the gluttony began with the Hurricane Zucchini Fries and Yam Fries by J&J The Original Potato Fries. 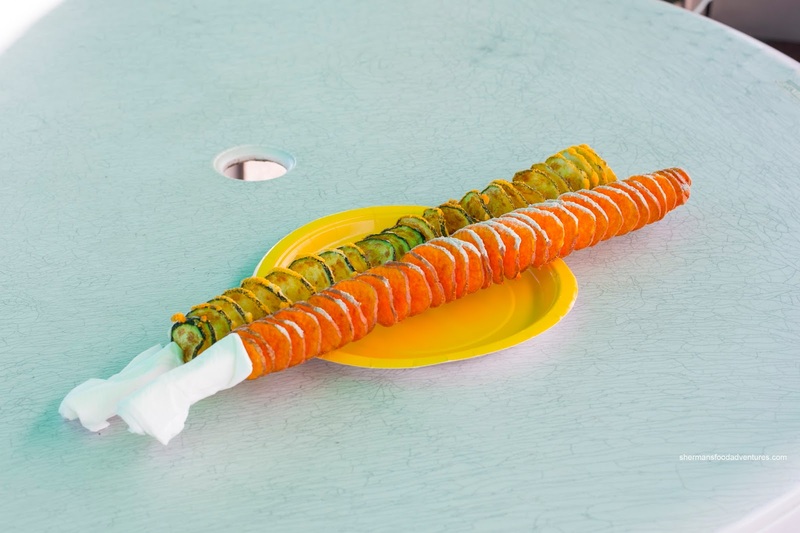 With only a light dusting of batter, they were able to crisp up the zucchini despite its water content. However, for the parts we didn't eat immediately, it did get soft. That wasn't an issue with the yam as it was crunchy from start to finish. For both, there was more than enough seasoning that accented the natural flavours. 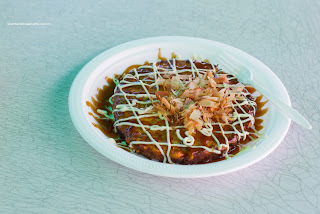 Next up, we sampled the deep fried Green Onion Pancake from New Style Green Onion Cake. As their namesake suggests, this was not like the traditional pan-fried version. Rather, it was almost waffle-like in texture with only a smattering of onion. 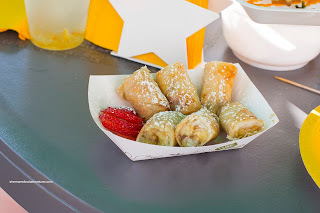 Also from the same booth, we had their Banana Spring Rolls which were served as a sweet interlude prior to more savoury eats. This was simple, yet a well-executed spring roll that was crunchy, easy on the grease and filled with sweet ripe banana. 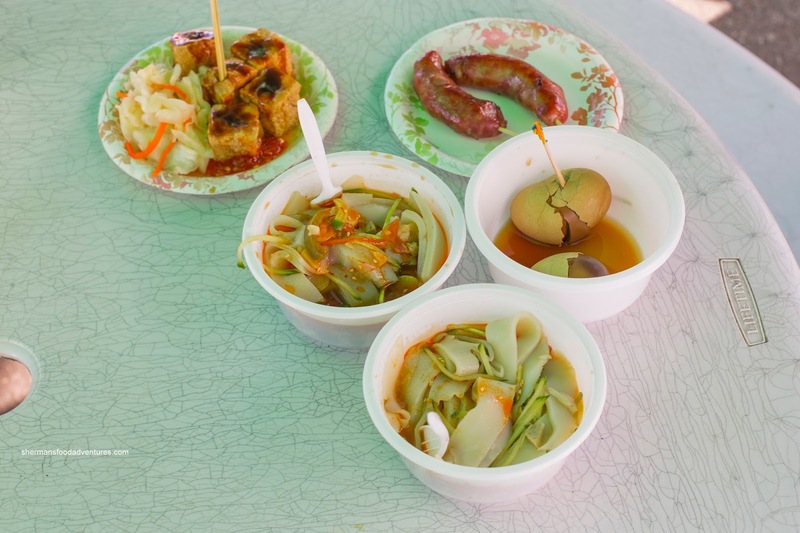 After this, we were hit with a wall of food including the Deep Fried Stinky Tofu by and Taiwanese Pork Sausage by Taiwan Traditional Snacks (Lu Gang Lao Jie). I thought that the pungency of the stinky tofu was just right with an appealing sharpness. As for the sausages, they were meaty with a touch of fat and of course were typically sweet. Along with these, I tried both the Sesame Sauce and Tomato Sauce flat noodles from Cold Steamed Noodles. These featured soft rice noodles that were bathed in a significant amount of sauce. I much preferred the tomato version as it had more of an impact with a slight tang to go with the dominant sweetness. 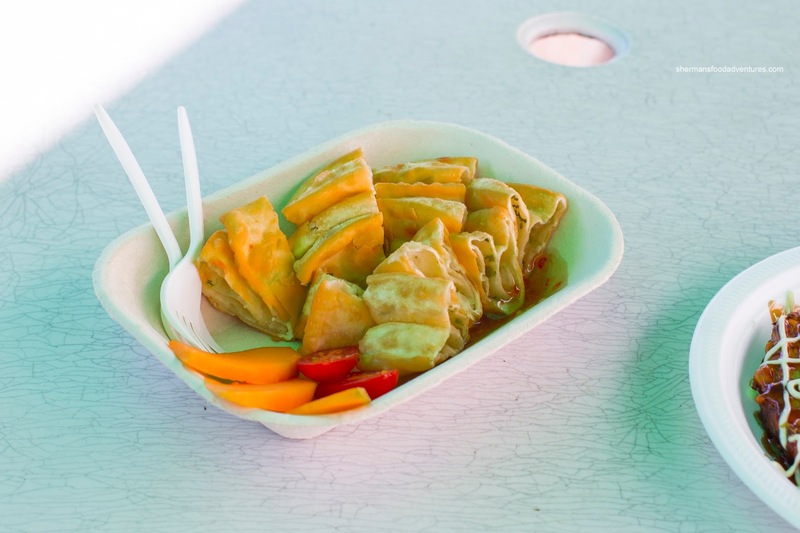 Continuing on, we got one of the standards of any night market being the Potstickers from Top Wok. These were masterfully seared where the bottom of the dumplings were super crispy and browned. The wheat wrapper itself was a touch thick, but not overly doughy. Inside, there was a good mix of juicy pork and veggies which was accented by the sweet soy. 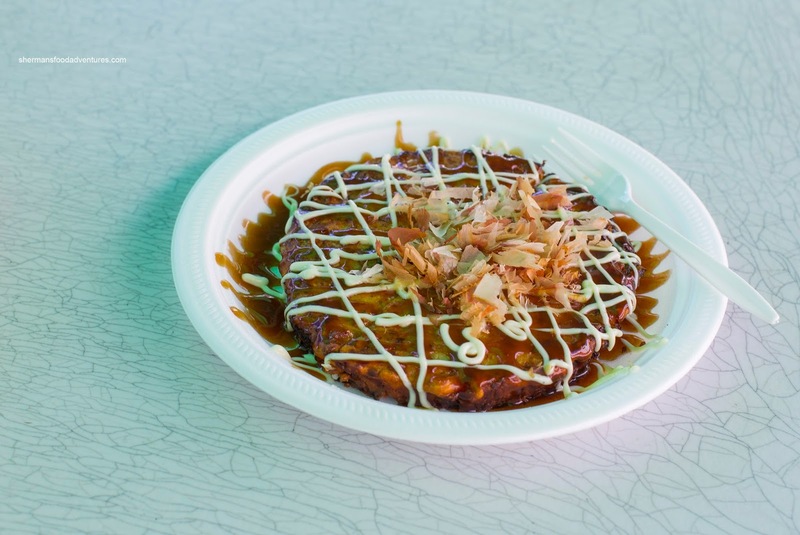 Moving onto something Japanese, we dug into the Okonomiyaki from Cocoro doused with a considerable amount of sauce and some mayo. This was soft and almost fluffy which contrasted its appearance. Since it was devoid of any meat, the whole thing also ate light. Despite the amount of sauce, it didn't taste over-seasoned with only a moderate sweetness. 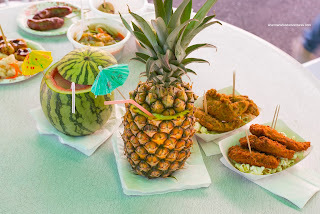 Acting like a palate cleanser, we were presented with one each of the fresh Watermelon and Pineapple Juice from All About Ice Cream served in the fruit itself. I've had these before and I definitely prefer the pineapple more due to the sweet acidic juice. As much as the watermelon was refreshing, it didn't have the impact of the pineapple. Looking at the picture and to the right of the fruit, we took a bite into the Chicken Strips from Chicken's Breading Fav (don't understand this name though!). We were presented with both the regular and a herbed version. These were definitely juicy with a lightly crispy breading on the outside. 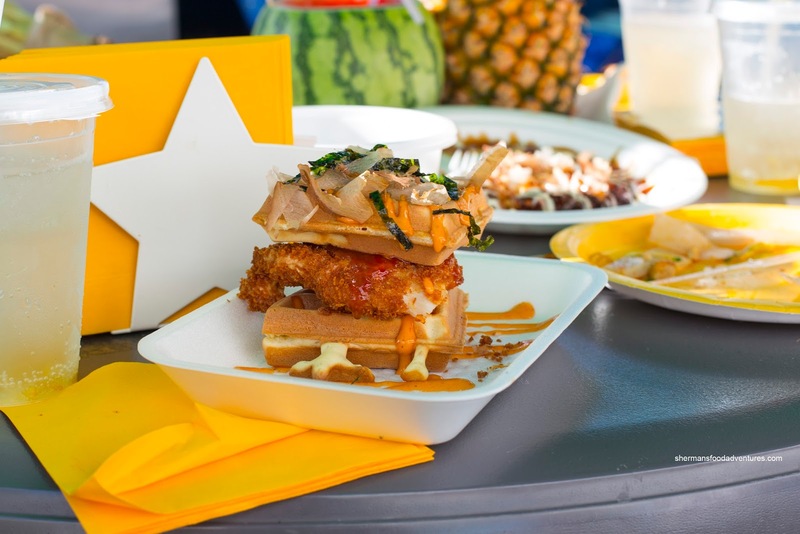 Onto something related, but a bit more interesting, we tried the Chicken & Waffles from Mother Clucker's (love this name!). With an Asian twist (nori, bonito, chili mayo and sweet chili mayo), this was rather tasty. 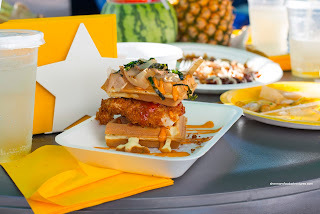 The waffle was nicely crisp while the chicken strip benefited from crunchy breading. Personally, I could've done without the sweet chili as it was the dominant flavour. I'm a big corn fanatic, so when we were able to customize Corn on the Cob from Fresh Roasted Corn with a variety of salts and seasonings, I started to salivate (even though I was getting full). 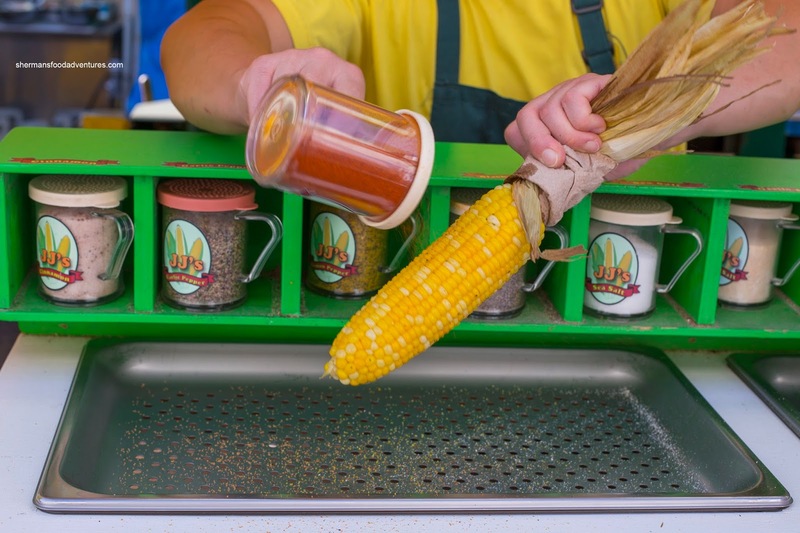 As simple as corn on the cob can be, the ear I had was masterfully prepared where it was just cooked with sweet bursts of juice from each niblet. I had a combination of garlic powder, salt, cayenne and Parm which elevated the natural flavours as well as adding a nice kick. 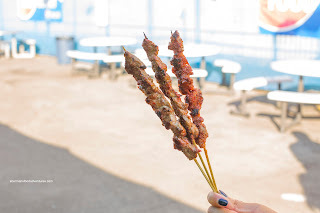 From there, we proceeded to try both the Lamb and Chicken Skewers from Xin Jiang A Fan Ti Halal BBQ. 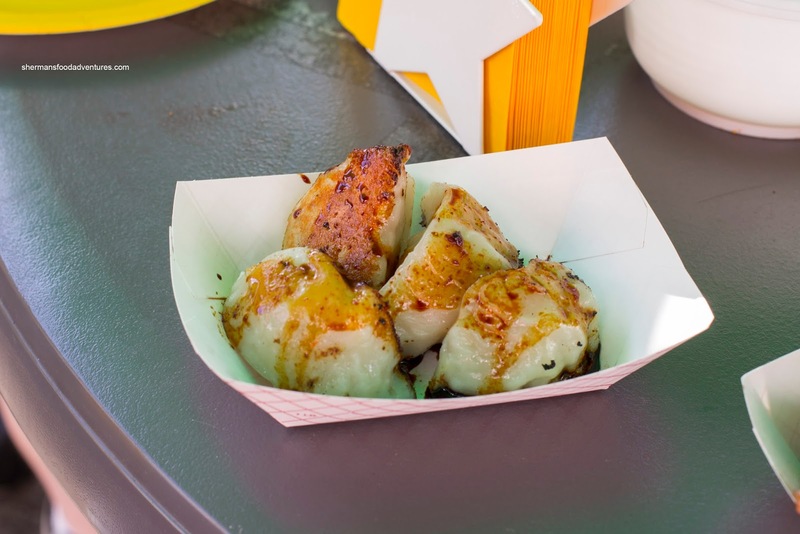 These were pretty addictive with enough seasoning to tickle our tastebuds. There was spice and saltiness to go with the natural sweetness of the meats. It was pretty cool to watch them being made as they were seriously getting an ample charring from the grill. Of course a visit to the night market wouldn't be complete without some BBQ Squid Mix from Lao Er BBQ. Consisting of both squid rings and tentacles, the mix was grilled with a mildly-flavoured satay sauce. As much as I enjoyed the texture of the squid (being chewy with a slight bounce), I didn't get much impact in terms of taste. 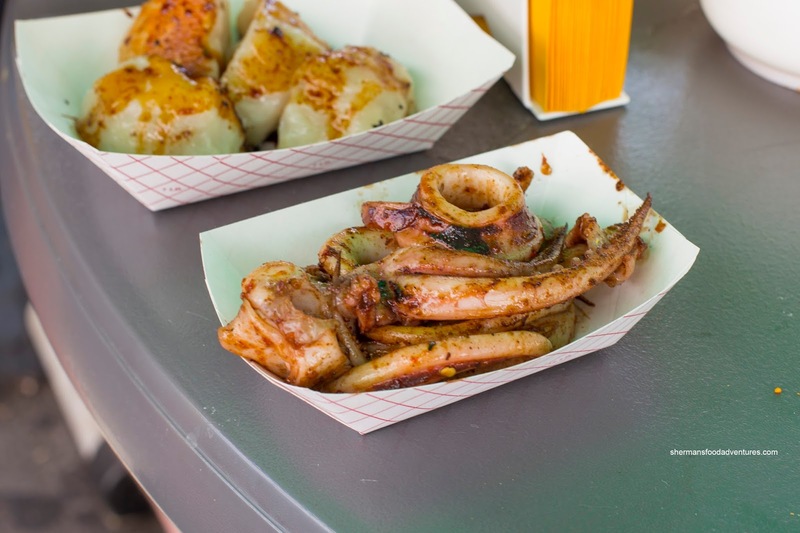 Maybe the sauce did not caramelized onto the squid itself. 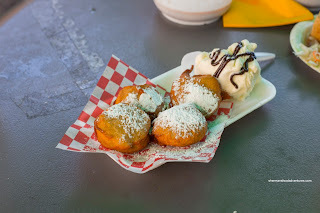 From squid, we went to Deep Fried Oreos served with ice cream (something I've had at the PNE before) from Cocoro. Yes, the various things subjected to a light batter and then deep-fried has been nearing ridiculous levels. However, I didn't mind the oreos as they became soft and warm with the trademark sweet icing and chocolate cookie. This one was almost a carbon copy of the one from the PNE. Continuing on with the sweets, we got the impressive-looking Fruity Ice complete with watermelon, fruit cocktail, banana, red bean, ice cream and condensed milk. 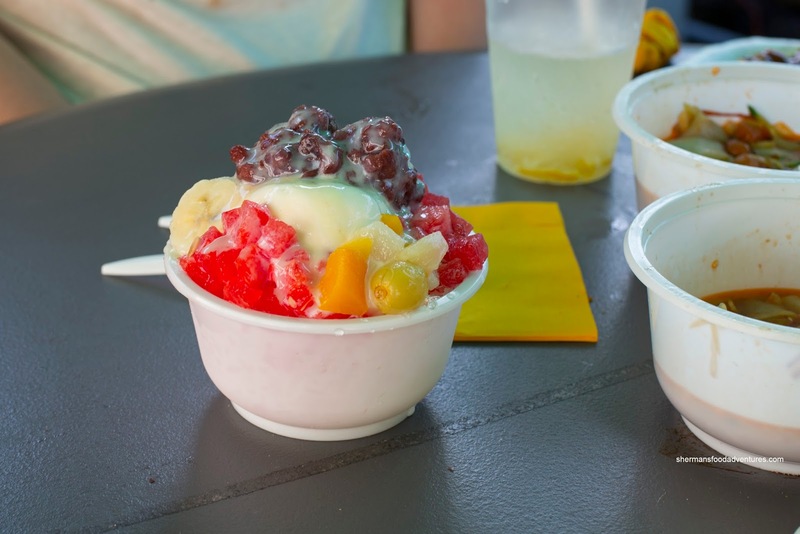 As you can imagine, this was fairly sweet due to the condensed milk, red bean and ice cream. When mixed together, it didn't get much milder as the ingredients completely flavoured the ice (which melted quite quickly due to the temperature outside). 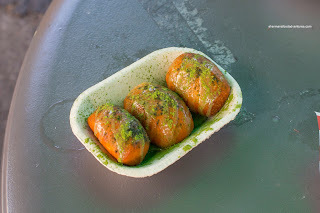 With the same sticky and sweet condensed milk, our Green Tea Fried Mantou from Amazebuns was more than adequately sweetened. However, due to the blank canvas of the fried mantou, the sugariness was spread out somewhat. Generously sprinkled on top, the green tea was noticeable and slightly bitter (which counteracted the sweetness). Although we'd already had several rounds of dessert, the gluttony did not end there. The good news was that we had something lighter and not sweet. 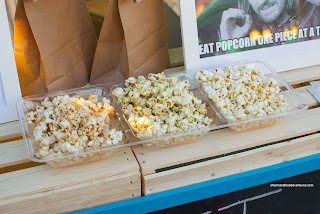 Over at Mr. & Mrs. Poppins Popcorn Bar, we sampled the Truffle Parmesan Popcorn and Sweet Seaweed Furikake. Lightly popped with a buttery crunch, the popcorn was dressed in enough seasoning for impact. 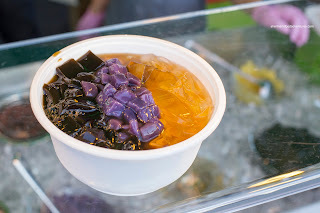 Back to the sweets, we headed over to Soy Boy for their home-made Sweet Tofu Pudding with honey cubes, sweet purple potato balls and grass jelly. This was surprisingly one of my favourites of the night as everything was fresh and only lightly sweet. Even the ginger simple syrup was not sugary, which afforded me the opportunity to enjoy the dessert without getting sick of it. 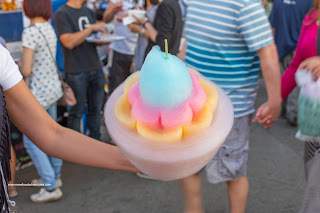 The most visually-striking item at the ISNM had to be the Flower Cotton Candy by Sugar Twist Cotton Candy. Yes, the darn thing wasn't cheap, but seeing how much time and effort was put into creating the candy art, one can understand. Now as much as the final product was super-impressive to look it, eating it was like typical cotton candy. Now I couldn't end off my night of eating with cotton candy could I? 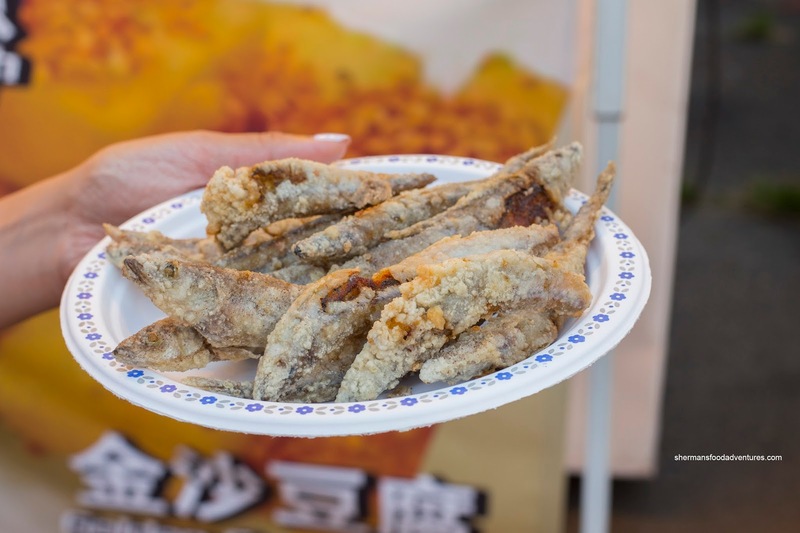 So I made one last stop at Golden Sand Club for a plate of their Deep-Fried Capelin Fish (the ones with a tonne of eggs). Despite the indifference of the staff and substantial wait time, it was ultimately worth it as the little fish were crunchy and well-salted. Inside, the meat was moist and yes, it was filled with the delicious roe. Okay, we stopped eating at this point. We were really too full to try anything else despite the little voice inside my head saying otherwise (or was that Mijune's voice?). Although the ISNM lacks the merchandise booths of the other night market (as well as being smaller), it makes up for it with the layout of the food stalls. There is much more room to maneuver as well as the lack of an entrance fee.